↑ Clarke, Gerald (20 August 1984). "Show Business: The Mellifluous Prince of Disorder". Time Magazine. 124 (8). Retrieved 30 September 2013. ↑ Kalfatovic, Mary C. (2005). American National Biography: Supplement 2. New York, NY: Oxford University Press. p. 64. ISBN 978-0195222029. ↑ Sellers, Robert (2009). Hellraisers: The Life and Inebriated Times of Richard Burton, Richard Harris, Peter O'Toole, and Oliver Reed. New York, NY: Thomas Dunne Books. p. 145. ISBN 0312553994. ↑ "Quigley's Top Ten Box-Office Champions (1932-Present)". Tony Barnes Journal. Archived from the original on 3 October 2013. Retrieved 29 September 2013. ↑ "Biography for Richard Burton (I)". Internet Movie Database. Retrieved 29 September 2013. ↑ "Richard Burton: Life, 1957-1970". The Official Richard Burton Website. 2012. Retrieved 20 May 2014. ↑ Bragg 1988, pp. 7, 10, 11; Munn 2014, p. 15. ↑ "A Selection Of Richard Burton Personal Items". 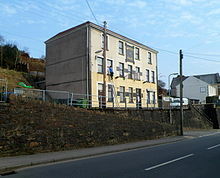 The Richard Burton Museum. Archived from the original on 15 April 2016. Retrieved 15 April 2016. Alpert, Hollis (1986). Burton. New York City: G. P. Putnam's Sons. ISBN 978-0-399-13093-9. Bragg, Melvyn (1988). Richard Burton: A Life. Boston: Little, Brown and Company. ISBN 978-0-316-10595-8. Cottrell, John; Cashin, Fergus (1971). Richard Burton, very close up. Upper Saddle River, New Jersey: Prentice Hall. ISBN 978-0-13-780908-0. Ferris, Paul (1981). 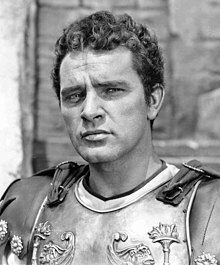 Richard Burton. New York City: Coward, McCann & Geoghegan. ISBN 978-0-698-11106-6. Munn, Michael (20 March 2014). Richard Burton: Prince of Players. London: Aurum Press. ISBN 978-1-78131-373-2.